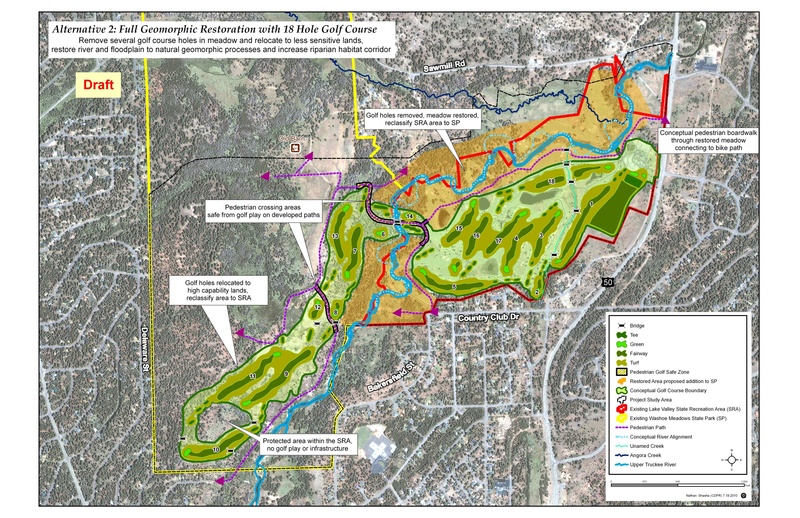 Alternative 2: River Ecosystem Restoration with Reconfigured 18-hole Regulation Golf Course This alternative would include removing part of the existing golf course and re-configuring it onto higher capability land to the west of the Upper Truckee River . The river would be restored to a geomorphically functional configuration reconnected to the floodplain and the golf course would be removed from most of the river meander belt and adjacent floodplain and restored to meadow. The exchange of land would be approximately equal between State Park and State Recreation Area. All of the current bridges through the golf course would be removed, and one new bridge would be constructed that would allow for golfing traffic and also dispersed recreational traffic. Under this alternative, part of the golf course would be relocated onto higher land further away from the river to make room to restore the river and floodplain. Using a combination of reconstructing meanders that were previously cut off or obliterated, the channel would be lengthened and the stream bed raised. Restoration of a natural meandering pattern and raising the river level to re-connect it to the floodplain would reduce erosion, raise the water table and restore valuable riparian and meadow habitat. Under alternative 2, the reconfigured golf course would be approximately the same size as the existing one, but the course would be removed from the stream zone and the river and riparian habitat restored. The area being studied for relocation of the golf course in alternative 2 was selected to minimize golf landscapes located in floodplain and meadow areas.The area impacted by golf course relocation would be mostly upland forest, which had been logged and quarried prior to acquisition by state parks. The area restored would be reclassified as state park, and the area where the golf course is relocated would be reclassified as state recreation area. It would be an approximately equal exchange of land area between the two units, but the golf course would be on less rare and sensitive lands, and the ecologically important river and floodplain would be able to function naturally and provide a continuous corridor for wildlife. The new golf course would be constructed using modern environmentally sensitive design and management strategies.